Author William Arthur Ward wrote “the pessimist complains about the wind; the optimist expects it to change; the realist adjusts the sails.” In regard to ever-increasing boosts in equipment technology and player strength over the years, Augusta National has proven to be a realist, tweaking and altering its’ layout to stay a well-heeled step ahead of the modern game. 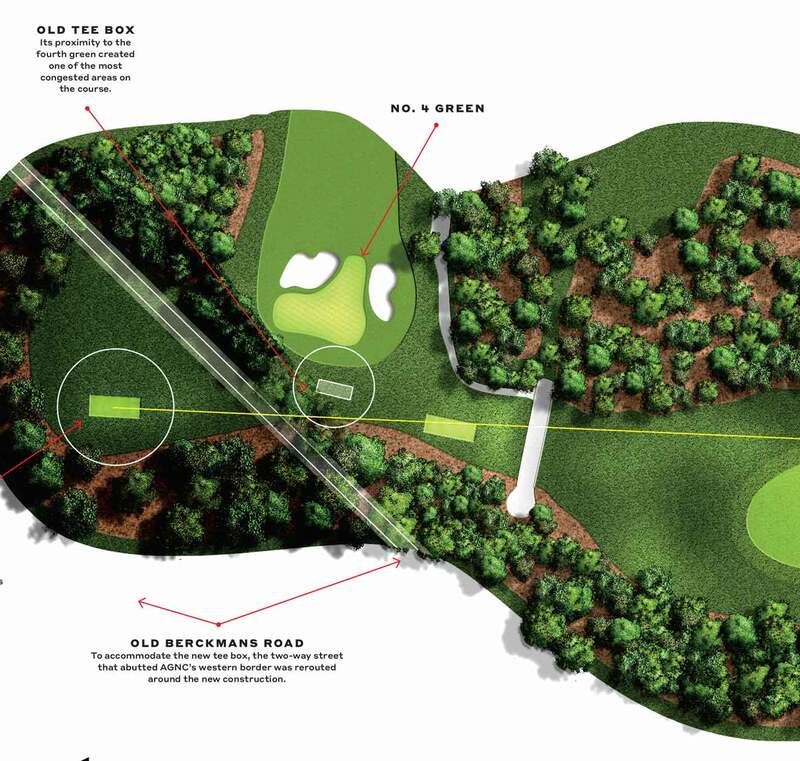 The latest hole to go under the knife is the par-4 fifth, which will debut a new tee box and bunker placement for the 2019 Masters. The hole now stretches to a stout 490 yards, 40 yards longer than in 2018, and features a new bunker placement. The left-side fairway bunkers—long the key to unlocking the best approach to the fifth’s intimidating green—return closer to their original position, and newly planted trees will mimic the hole’s design from 1934. Originally, No. 5 demanded a 240-yard carry over the left bunkers, but this eventually became an afterthought for players in the post-persimmon era. In 2003, ANGC moved the bunkers 80 yards forward. More work on the hole came in 2011— the tee was extended back five yards, and the bunkers were moved further into the fairway. These changes narrowed the driving corridor and made the tee shot far more difficult, killing the hole’s strategic value. A glimpse at how far apart the old and new tee box at Augusta National's fifth hole is. Really, the only play was a safe 3-wood off the tee, leaving a short iron approach. No. 5, one of MacKenzie’s strokes of genius, had become a snooze fest. The proof lay in the scoring stats: Since the last round of alterations to the fifth, it has seen a rise in pars and a decrease in the number of bogeys and birdies. The newest round of changes at No. 5 signal a commitment, as Chairman Fred Ridley remarked during his inaugural pre-Masters press conference,“to protecting the shot values Mr. Jones and Alister MacKenzie devised.” The new tee box, moved back forty yards over what used to be Old Berkmans Road, and the new bunkers situated to create greater width (almost twice the room as before), will again offer players a very real risk/reward opportunity. Players will be forced to either challenge the bunkers to gain a shorter approach into the green or play safe to the right. 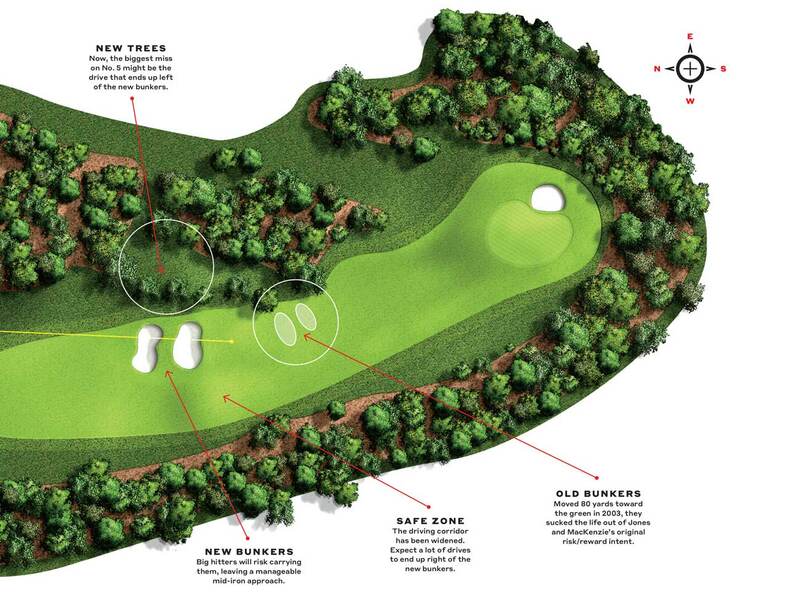 (Playing short of the bunkers is an unlikely option—it will leave a semi-blind approach from well over 200 yards.) The safe play right of the bunkers will fit into MacKenzie and Jones’ intended design: Give players a clean look at the green and a good lie, but from 200- plus yards and from a poor angle. How things look on the fifth hole at Augusta National on the fairway and near the green. Scoring trends at the Masters reveal that the holes that remain true to their architectural intent tend to retain their scoring distribution. The par-4 10th, for example, has been altered to ensure that approach shots are played from roughly the same locale. This hole has seen little to no change in scoring average. Expect to see a similar pattern with the new No. 5—but with a lot more excitement. With the shot option restored to the tee, many of the pars that have suffocated N0. 5 will be replaced by birdies and bogeys. It’s going to be fun to watch.